Where did the dust come from, what caused it, and what did it mean? Using a computer simulation model an international research team lead by Monash astrophysicist Associate Professor Daniel Price may have found the answers to these questions. “Astrophysicists all over the world have been trying to understand what could create the strange horseshoe shape,” said Associate Professor Price, who is also an ARC Future Fellow at the Monash Centre for Astrophysics (MoCA) in the School of Physics and Astronomy. “These swirling discs of gas and dust around young stars are the birth places of planets like the ones in our Solar System,” he said. Pictures of the disc around the young star HD142527 taken since 2013 have revealed many other strange phenomena — a big `hole' or cavity in the middle of the disc, fast flows of material across this hole, faint `streamers' of gas, spiral patterns and `shadows' around the edge of the hole. The cause of these strange phenomena has led to intense speculation. 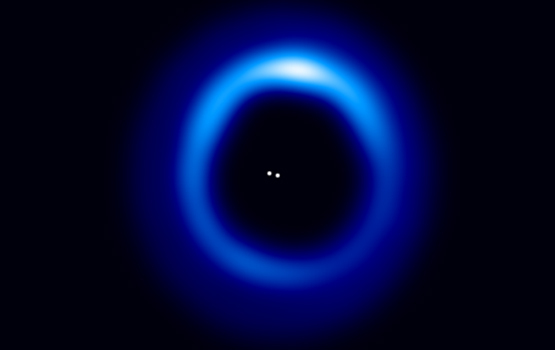 “For the first time, we have shown how the dust horseshoe, cavity, fast flows, streamers, spirals and shadows could be explained with one simple answer: the disc orbits two stars not one,” said Associate Professor Price. The findings are described in a recent paper published in Monthly Notices of the Royal Astronomical Society. The researchers used supercomputer simulations to model the influence of the second star on the dust and gas in the disc around HD142527. “We showed how the second star carves a hole in the middle of the disc, creates a giant `horseshoe’ in the dust, produces spirals and streamers feeding across the hole and even the shadows that are seen,” Associate Professor Price said. Will the same computer simulation be able to explain the cause of other unexplained phenomena in space? “Normally we would expect the two stars and the gas disc to orbit in the same direction — like the planets in our solar system all orbit in almost the same plane,” said Associate Professor Price. “In this case the models show the two stars are orbiting in a plane which is almost 90 degrees to the disc.